With the eerie images from Numb still lingering in our minds, Anthony Capristo makes a speedy return to Directors Notes with a poetic reflection on past hurts in new work The Fear of Breathing in the Void. Playing across two parallel, non-linear narratives, this existential piece from the German filmmaker seeks to achieve catharsis in the face of fear. Anthony takes us through the philosophical and technical challenges of bringing this reckoning between past and present to fruition. It is the art pieces we love which influence the work of artists the most. For an artist, a single sentence he hears or a line he reads can be sufficient to create an initial idea which he follows enthusiastically. The idea puzzles you, as it creates a chaos of coded image fragments in your mind which have to be deciphered and sorted. This process is my personal sensation of true inspiration. A year ago, I was plowing through a tremendous number of books written by Stephen King. I did not count them, but there surely were a lot and I highly enjoyed every single one. The story inspiring me the most was Pet Sematary, an archetypical classic novel telling the story of a secret place hidden in the woods where dead people are brought back to life. Since then, the plot has been a defining source of inspiration for my films: from the mysterious secrets of the forests (the latter already featured the supernatural in H. P. Lovecraft’s books and later also in David Lynch’s TV show Twin Peaks) to the morally reprehensible God complex. However, one of the most interesting thoughts is the following: If a person plays God to compensate for his emotional deficit, he must understand that he will eventually face the devil. In any form whatsoever. The Fear of Breathing in the Void refers to these topics and develops them: It is about the return to a place of the past and the associated hope for catharsis. Initially, this seems proverbial, but should also be seen metaphorically: the return as a long overdue time travel, as a confrontation with one’s own fears and feelings of guilt, and as a struggle with the demons of the past. Also the forest stands for more than a place, combining nostalgic and traumatic childhood memories. There is something lurking in it. Something that we humans are not meant to understand. Something mysterious that contains all the mysteries of life. The idea puzzles you, as it creates a chaos of coded image fragments in your mind which have to be deciphered and sorted. At first sight, the two worlds of past/remembrance and present/reality seem to be clearly separated from each other. The predominant colors differ and so do the movements of the camera as well as the music themes. Still, I tried to break up the now and then with a non-linear narrative and an elliptical editing concept. Time seems to stand still when the surreal picture language and the poetic narrator (which is directed to the deceased brother and himself) blur the lines between reality and nightmare. Finding the ideal spots for shooting took the most time during pre-production. We drove into various forests and visited countless locations taking pictures. 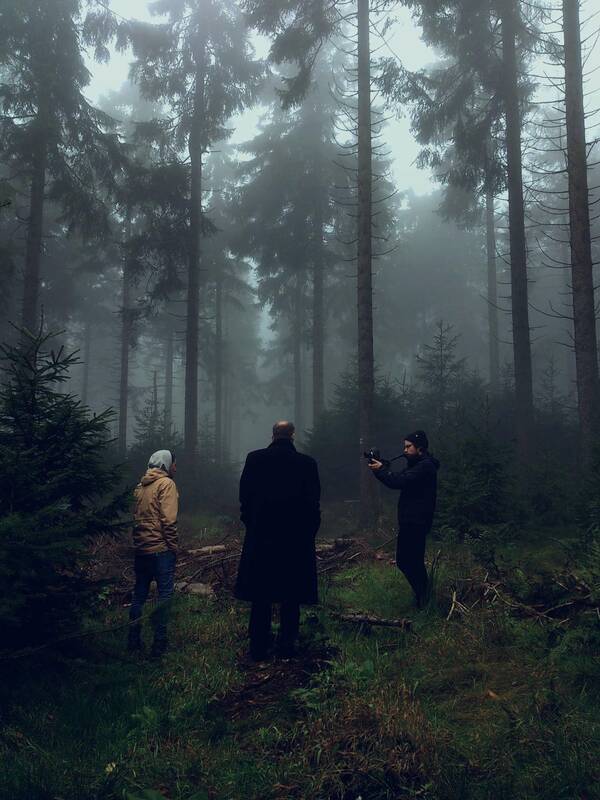 In the end, we decided to shoot at the Grosser Feldberg, a mountain not too far from Frankfurt (Germany). Depending on the light, the mountain provided us with either dark and mysterious or beautiful and dreamy sceneries. As we shot the film in the beginning of October, we were highly concerned about the weather in that area. But luckily, we did not get caught up in the rain at all. We shot over the period of 3 days, using a hacked Canon 5d Mk III producing raw material. We intentionally kept both the crew and equipment quite small. So we only used a shoulder rig, steady cam and reflectors. The sound was completely designed inside the studio. Thanks at this point to my Composer Perschya Chehrazi (who was also responsible for all music related topics), to Manuel Schamberger for his excellent camera work, to Hermine Smit for her great support as producer, and to Purepixel for their brilliant grading of the movie. And finally, a big thank you goes to our actors Mika Binzen and Thomas Mill, as well to Mark Janicello for performing the voice over. At the moment, I am working on several projects in parallel. This includes both commercial as well as artistic films. I will surely keep you guys posted.